Yesterday, we had some old and new friends over for a 4th of July barbecue. We had a great time and conversation was generally lively. We had a ton of food and we all ate and drank to our collective fill. The kids ran around the house and played…and played…and played. Good times were had by all. In the late afternoon, most of the adults were chatting about world affairs and the conversation was a bit of an eye opener for me. I live a nice life, safe, and not lacking for material needs (notice I did not say wants…). I do not travel much internationally as I have been out of the United States only once in the last ten years. My idea of “roughing it” is beach side service shutting down at 6pm. A few of our guests have lived and travelled extensively outside of the United States. I got a bit of an education about life in a few different parts of the world. South Africa has several problems to tackle. 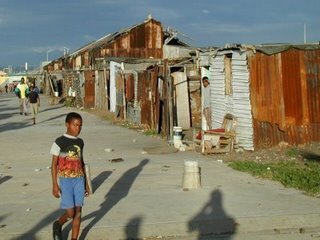 The country suffers from high poverty and the ramifications of the government’s prior apartheid policies. The education system is need of major repair and crime in the non-affluent areas is intense. Assaults, theft, murder and revenge killing are almost common place once you exit the affluent centers. South Africa has no social security system and whole generations of uneducated citizens. This had lead to the high and extreme levels of poverty. When people are hungry, angry and desperate, life looses it value and is treated as such. I sit back in my comfortable chair and listen, in my big house in a great neighborhood that is part of a quite community…with friends over and lots of food. My God do we have it good! I do not fear for my life or the lives of my children. I do not worry about getting murdered over the ten dollars in my wallet or having everything I own stolen when I go to sleep. That afternoon, listening to the personal stories, made me realize just how great we have it. Sure we have our problems with poverty, crime, etc. but nowhere near to those levels in Africa and the Middle East where lives have little value. I am sure that most of us are on a three day weekend. Take this time to be grateful for everything you have and imagine what life could be like, both for the better and the worse. I am a very conservative person, but I have to be honest, the conversations yesterday made me really think about social services and the role they play in a society. Are they compassionate help for our fellow citizens or a method to maintain civil order for the rest of the “productive” population? Which one is it, or maybe it is both? Without institutions like Welfare, Medical, Medicare, Social Security, Etc. what would the state of our society? Would crime be so high that we would all be sleeping with a loaded .38 under our pillow? I think not as our unemployment rate is under 9%, but what would happen if the unemployment rate hit 40%? Our reality would be altered dramatically. Now remove the concept of social services, we would have riots in the streets. I am not advocating an increase in social services or taxes. Frankly, the choices for a “new” administration scares the heck out of me…I am taxed enough already – seriously…and government can not manage its way out of a wet paper bag. I am STARTING to CONSIDER a possible change in my beliefs. Maybe, several social programs should continue (several should be eliminated as well) but with a greater focus on fraud detection/prevention. Believe it or not, this is a big change for me, and a rather profound one. This will require much more thought. What a difference a day can make. I hope your 4th was a grand day. Be happy and be well.